If you are looking for that quiet private spot located within a pristine New England Harbor, a visit to Cohasset Harbor Marina fits the bill. Protected and serene, nestled in a secluded section of Cohasset Harbor, CHM offers boaters the true flavor of both yesterdays and todays New England coastal towns. Our facility is within walking distance of fine restaurants and a comfortable harbor hotel. Cohassets town center with its boutiques and cafes along with convenience and hardware stores are within walking distance. Only 16 nautical miles to Boston, a cruise into Boston Harbor can be a straight shot or can be an adventure, cruising your way through the Harbor Islands State Park. Catch the main channel into Cohasset Harbor from the open waters of Massachusetts Bay by locating the #2 nun at the mouth of "The Gangway" and head into Cohasset Cove. 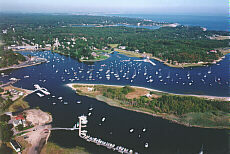 Cohasset Harbor Marina is on the far southeastern side of the harbor. For detailed Cohasset Harbor navigation information please use NOAA chart #13269. Restaurants: Atlantica, Old Salt House, The Red Lion Inn (which also can provide lodging) and Kimball's by the Sea, a comfortable hotel overlooking the harbor. Bassing's Beach, Government Island. Copyright © 2010 Cohasset Harbor Marina LLC.